Make sure you always have a bag to clean after your dog with the biodegradable Bon Ton Doggy Bag Refills. Just because of what they are, doesn’t mean they can’t be stylish with the unique Zebra design! These strong, biodegradable waste bags are the perfect fit for Bon Ton Classic, Fluo and Macaron bag dispensers. Each refill pack contains 3 rolls of 10 bags. Strong and biodegradable waste bags. Suits United Pets Classic, Fluo and Macaron dispensers. Each pack contains 3 rolls of 10 bags. Looking for smaller waste bags to suit your Nano Waste Bag Dispenser? 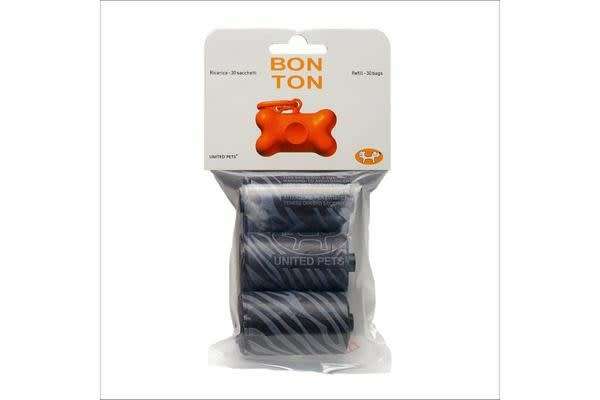 Try Bon Ton Nano Refill Waste Bags.